A GoCD Administrator can authorize users and roles to be administrators for Pipeline Groups. These group administrators have certain privileges which are explained in the section “Privileges of a Group Administrator”. In the above screenshot, the GoCD admin has delegated group admin privileges to a user “jez” and all users defined under the role “groupAdminRole”. The privileges of a Group Administrator have been described in the next section. View and operate (trigger, rerun stages etc.) all the pipelines in this group. 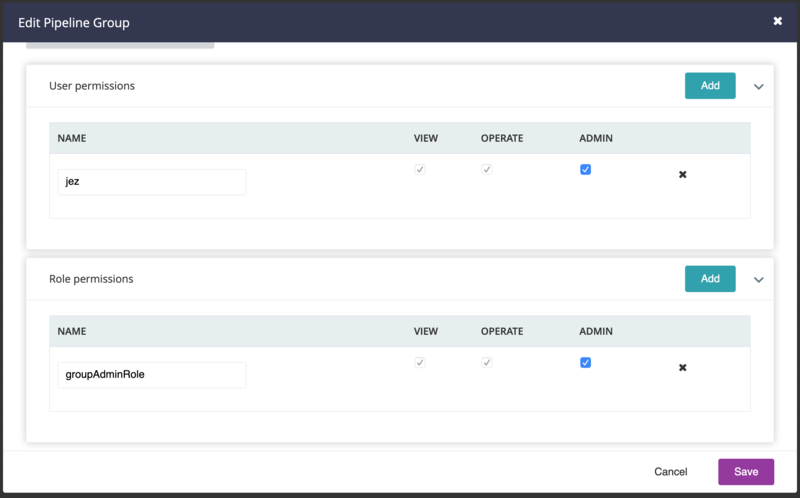 Authorize users/roles with ‘view’ and ‘operate’ permissions for this pipeline group. Add and Delete pipelines to/from the group. Add a pipeline using the “Add New Pipeline” wizard, but only to the groups he is allowed to administer. Edit pipelines belonging to the group. Which includes renaming, adding, deleting and modifying stages and jobs. Restfully view and operate (trigger, rerun stages etc.) all the pipelines in this group. Restfully edit the pipelines belonging to this group. Note: A group administrator can access “Pipelines” and “Config XML” tabs on the Administration page to view and edit his/her pipeline groups. He/She cannot access Server Configuration or perform user management. While a group administrator cannot access Pipeline Templates either, they can use existing templates for pipelines within their pipeline group.